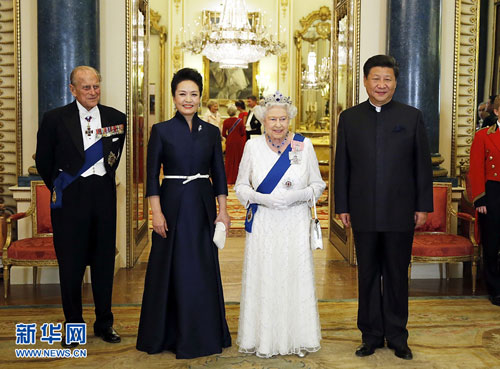 On October 20 local time, President Xi Jinping and his wife Peng Liyuan attended the grand welcoming banquet hosted by Queen Elizabeth II of the UK in the Buckingham Palace. Inside the Buckingham Palace the lights shone brightly and the flowers bloomed beautifully. Xi Jinping and Peng Liyuan received warm welcome from Queen Elizabeth II and her husband Prince Philip, Prince William and his wife, Princess Anne, Prince Andrew, Prince Edward and other royal family members. Queen Elizabeth II and President Xi Jinping delivered a speech respectively, speaking highly of the benefits brought by the constant progress of China-UK relations to the two countries and the whole world. The two heads of state emphasized the need to constantly develop the comprehensive strategic partnership between China and the UK. In her speech, Queen Elizabeth II expressed that this year is very special for UK-China relations, with unprecedented level of bilateral cooperation and friendship. President Xi Jinping's visit to the UK is a significant milestone which will elevate the friendly relations between the two countries to a new height. UK-China relations are truly global partnership. This year marks the 70th anniversary of the founding of the United Nations (UN), and as permanent members of the UN Security Council, both UK and China are guardians of the international system and bear the responsibility to cooperate in conflict resolving and poverty reduction, resource protection, tackling climate change and other issues, so as to make positive contributions to the safety and prosperity of peoples of the two countries and the whole world. In his answering speech, Xi Jinping pointed out that China and the UK are the outstanding representatives of the two great civilizations in the East and the West. Though far away from each other geographically, the two countries have always influenced each other. The exchanges and mutual references between both civilizations have not only enriched respective civilization achievements and promoted social development, but also made remarkable contributions to the progress of human society. Xi Jinping emphasized that this year marks the 70th anniversary of the victory of the Chinese People's War of Resistance against Japanese Aggression and the World Anti-Fascist War, as well as the 70th anniversary of the founding of the UN. As allies in the World War II, the Chinese and the UK people supported each other, shared weal and woe and forged the never-fading friendship in the flames of war, which became precious wealth in bilateral relations. As founding members of the UN and permanent members of the UN Security Council, the two countries share a sacred obligation to promote world peace and development. The constant progress of China-UK relations benefits the two countries as well as the whole world. Since this year marks the beginning of the second decade of China-UK comprehensive strategic partnership, both sides should firmly grasp the opportunities and join hands moving forward thus together create a better future for bilateral relations. The banquet remained in a warm and friendly atmosphere from beginning to end. Wang Huning, Li Zhanshu, Yang Jiechi and other Chinese delegation members, as well as Prime Minister David Cameron, Leader of the Labor Party Jeremy Corbyn and others from the UK side attended the banquet.